I wasn’t an introvert until I took the Myers-Briggs. It was together, as a small group in a crowded living room, that we all took the test and discussed what our answers meant, where they were right and where they diverged from how we saw ourselves. For me, the test spat out the four letters INTP. Without going into what each letter means, INTP essentially placed me into a grouping called ‘The Logician’. I was now a thinker in the same personality bracket as Albert Einstein, Blaise Pascal and Renee Descartes. Throughout the evening, we all noticed the traits that confirmed each other's scores. ‘That’s so J’, ‘Of course so-and-so is E’. Treated as little more than a parlour game, we all laughed as stereotypes and quirks were confirmed in our presence. And then we all went home. Later, though, I noticed an INTP-ness was slowly framing a lot my own thoughts and actions. Where before I would like to just have a quiet read, this was now dubbed ‘introvert-time’. Whenever I felt a little spend after social events, ‘introvert me’ needed to regain my energy. At no point in my life had I felt like an introvert until I took the Myers-Briggs Type Indicator (MBTI) test. For many, this will not be their experience of it. With its near-universally positive descriptions of each type, the human brain will gladly eat up any MBTI results that confirm our own favourite aspects of self-identity. I felt smart when I got my answers - even if my own track record for science, logic, philosophy and mathematical thought looked emptier than a cornfield in December. But what the MBTI does is frame identity. It is a series of 16 boxes that can be easily deployed as a mould for any identity that isn’t totally sure of itself. It is, in a way, easy self-identity at a high cost. What the MBTI fails to communicate is that identity isn’t fixed. It grows and changes with us. The very fact that the MBTI has a 50% chance of giving you a different score on repetition of that test should be enough to tell you that you can’t apply a static score to a moveable self. So, in the wake of the MBTI decline, what are we left with? For anyone unfamiliar with the Enneagram, here’s a quick primer. Unlike the MBTI which is used as a signpost to a sense of self, the Enneagram is a tool for personal and spiritual transformation. Its name comes from the nine-sided shape that is used to articulate the nine different personality archetypes. Within this set of nine character types, there are three groups that each hold three of the personality types. These are called triads. What also sets the Enneagram apart from other personality typing systems is its age. Despite only coming into popular consciousness in the past 30-40 years - with a significant spike occurring in the past 5 years - the Enneagram is actually an ancient tool ‘whose Christian origins’, write Richard Rohr, ‘can be traced back to the Desert Fathers and Mothers of the fourth century’ Over many years, it was held as an oral tradition passed down generations of spiritual teachers. It is only recently we have seen it bloom into a new industry of personality typing, but because of its vague nature gaining a deep understanding of it takes years of thought and practice. There is great potential for spiritual understanding, but there is also (if we’re coming out of a post-MBTI mindset) a large chance of misunderstanding or misuse. One: A tool of realisations both good and bad: For here I am just going to go direct and quote Richard Rohr, “The purpose of the Enneagram [...] is the transformation of consciousness so that we can realize our essence, our True Self. [...] The primary goal of any spiritual tool is simply union with God/Truth, and then we get united with ourselves in the process!” It helps us see not only our gifts, but also our sins. What is remarkable is that highlighting those sins helps us see ourselves more clearly, and the paths we can take if we want to get closer to union with God. Two: A ‘radical tool for empathy’: This was how I heard Chris Heuertz describe it in a podcast, and I remember it as the moment a great amount of what I then understood about the potential of the Enneagram clicked into place. The MBTI was an ego-mirror of sorts. With it, I only thought about myself, about my needs and my character. But seeing the Enneagram as an empathy tool helped me, at least, to recognise that everyone around me is on a journey, and that they experience needs that would have never even occurred to me otherwise. For anyone wanting to go back to where our modern understanding of the Enneagram first appeared need go no further than The Enneagram by Richard Rohr. Subtitled ‘A Christian Perspective’, Rohr’s book was for many a touchstone for their understanding of the Enneagram. In it, he traces how the system came it’s present-day formation, and offers a way of spiritual counsel that it can provide. 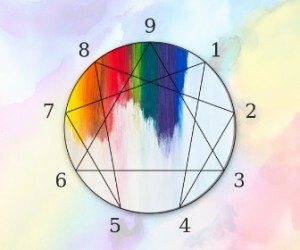 By no means finished with the Enneagram, Richard Rohr has gone on to mention it is a great number of his subsequent books, and at its most accessible in his recent book of devotional A Spring Within Us, which devotes one day at a time to each type, and a way to approach the system as a tool of transformation. Other books of note that explore the Enneagram from a Christian perspective include The Sacred Enneagram by Christopher Heuertz, who recently features on the Sleeping at Last podcast, and is both a reliable and deeply understanding representative of the system today. Focusing more on some of the practical and day-to-day aspects of how the Enneagram can work, The Path Between Us by Suzanne Stabile brings the principles explored in The Road Back to You to conversations about marriage and relationship, whilst Using the Enneagram in Prayer by Suzanne Zuercher does exactly what it says on the spine, giving you contemplative approaches to prayer and spiritual transformation through the Enneagram. And for a younger generation, for whom the Enneagram has taken on a particular and striking resonance, Millenneagram by Hannah Paasch helps smooth the road 20-30-somethings experience as they enter a period of self-understanding and change. Now, I won't offer an explanation of the nine types here. Either you are familiar with the Enneagram and so such a type list would be of no use or you are new to this all, in which case I would recommend taking the time to find where you sit before reading a list that may leave you identifying with the wrong descriptor. If you are already familiar with your own Enneagram numbers, here’s a ‘Recommended Reading List’ of sorts. I’ve picked out one book per type that (hopefully) helps you to understand yourself - your own strengths and weaknesses - and grow spiritually and personally. Zeal without Burnout by Christopher Ash was written for people who give everything in service and are left with nothing once the pews are cleared. Yes, the utopian desire to make the world a better place is worth celebrating, but this book helps you keep in mind that it’s no good if you yourself are spent. Look after yourself, and let yourself be looked after. It's Okay Not To Be Okay by Sheila Walsh may feel a lot like looking in a mirror. Typically, two’s are driven by a need to care for people but fail to admit the pain they feel when it’s not reciprocated. This book offers the space to talk and think about yourself, and to accept that fixing others doesn’t mean ignoring yourself and learning to accept yourself. Warts and all. The Freedom Of Self Forgetfulness by Tim Keller is almost the Bible of anti-achievement. If by the end you learn that being “good enough” isn’t the criteria for God’s grace, this book will have done you a world of healing. Being whole in God means being free from your own compulsions. Everybody's Normal Till You Get to Know Them by John Ortberg may seem like a joke suggestion to fours. It may feel like the blueprints that make you (and you alone) have been lost, which then creates the sense of loneliness in a crowded room that is almost emblematic of fours. But, if you see just a little bit of how everyone is weird and messed up and far-from-normal, you may feel a sense of God’s heart for you and everyone you know. A heart of acceptance. A Spring Within Us by Richard Rohr is a daily devotional book - meaning that rather than gearing-up to plough through it in search of whatever secrets and truths may be waiting, you need to go slowly. One day at a time. This choice is all about growing a sense of your self, your desires, your physicality and spirituality. Finding peace doesn’t come from understanding the external world, but from slowing down and recognising something about yourself and how God made you. Letting Go of Fear by Neil T. Anderson & Rich Miller is the most direct suggestion on this whole list. A great motivator of many sixes is fear, but if you can learn to step back and see things from God’s perspective, you may just learn what it’s like to have your actions inspired by excitement and safety - which is much closer to how the Bible says we should live. Everybody, Always by Bob Goff (or any book by Bob Goff for that matter) speaks to those excited by the possibilities that exist in life and in other people - even when they may frustrate and weigh us down. Embracing life isn’t about escaping the negative thoughts we have, but about admitting them and turning that pain into an opportunity to bring light. And few people shine quite as much as Bob Goff. Just Google him and you’ll see what I mean. God, Where Are You?! By John Bevere is for anyone feeling frustrated that God either isn't speaking or isn’t saying what you want to hear. Aside from having the most Challenger-sounding title of any book I’ve ever come across, God, Where Are You?! Helps you let go of the desire to be the driving force in God’s plan and surrender to a plan that seems invisible right now. The last thing faith needs is your strength. And that’s ok. Emotionally Healthy Spirituality by Peter Scazzero is all about emotions; something you will be incredibly well versed in. This pic is essentially speaking your language as fostering harmony in others is your bread-and-butter. But now it’s time to turn that impulse inwards. Here you’ll find a model of spiritual growth that is tied to emotional maturity. Contentment starts with your relationship with God. Not anybody else’s.